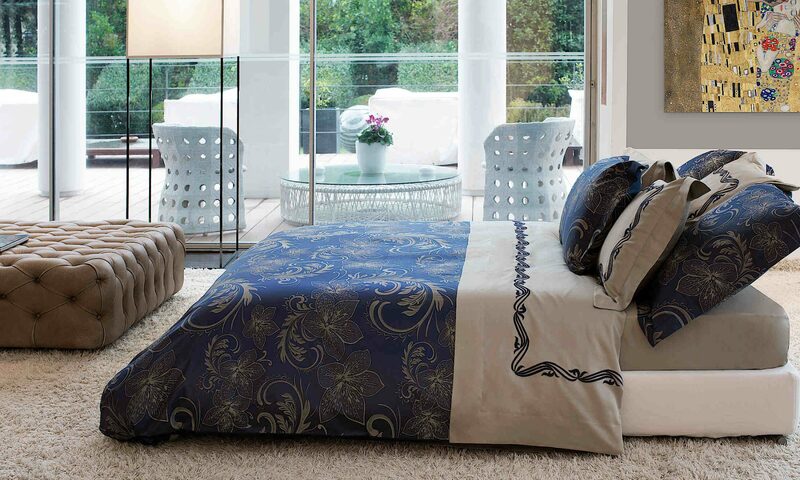 Peacock Alley creates an inviting bed, dressed in a whispered palette of ivory and platinum. 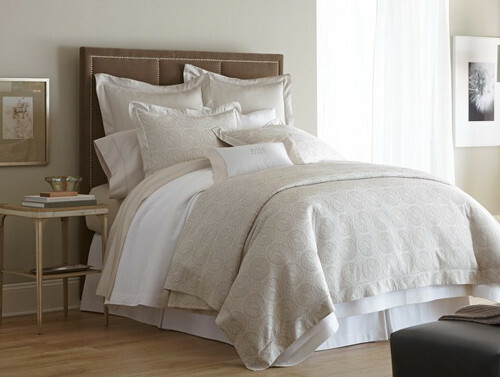 The Vienna collection, featuring a medallion design, is offered in a duvet, shams, and boudoir pillow and can be combined with a number of Peacock Alley coordinates in throws, coverlets, and sheeting. We especially like the Virtuoso sheeting collection for this ensemble because of the hemstitch detail. Timeless appeal and soothing colors make the perfect classic bedding ensemble. Now also available in white. 100% Egyptian cotton, yarn-dyed jacquard. Made in Portugal. The Signoria Spargi bedding collection with its intricate lace jacquard design conjures up the image of an elegant couture evening dress. The collection includes a duvet cover, shams, pillowcases, and a sheet set and is offered in two colorways: Wilton Blue/Camelia and Flax/Black. 100% Egyptian combed cotton. Made in Italy. The Lili Alessandra Mackie bedding collection is part of the Silk and Sensibility series of silk-like duvets, throws, and bed skirts. This tantalizing collection has the look and feel of silk, but is so much easier to care for because it is machine washable. The combination of taupe and blush illustrates a soft, chic design. Combined with the right elements such as an upholstered tufted headboard and luscious decorative pillows, the Mackie bedding ensemble creates a romantic ambiance.